Have you seen the giant Kisses made by Hershey? My husband actually mailed me one for our first Valentine's Day. (We dated long distance.) Ever since, the giant Hershey Kisses have had a special place in my heart. Melt butter and marshmallows in an extra-large glass bowl for 2 minutes on high heat in the microwave. Stir. Continue melting for an additional minute. Stir. Add Rice Krispies and stir thoroughly. 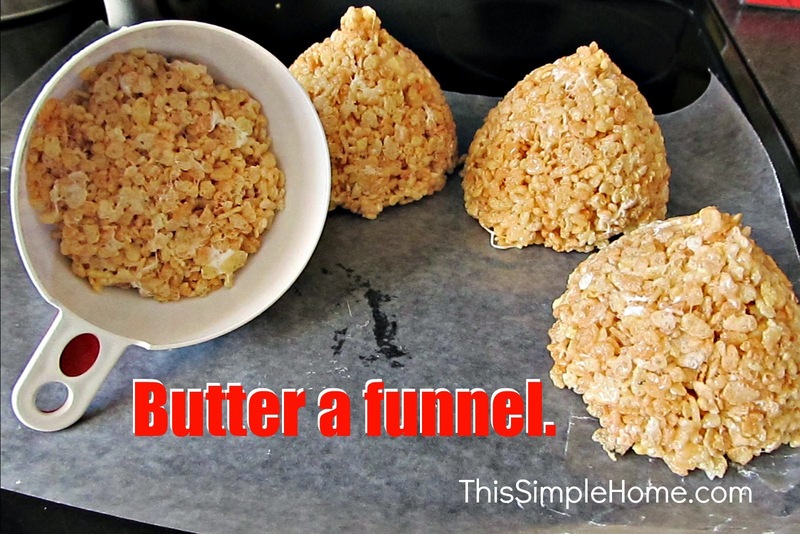 Press Rice Krispies mixture into a buttered funnel. Press mixture tightly by covering your hand with a baggy. Turn out onto wax paper. This recipe will make 4 or 5 giant Rice Krispie Kisses. Allow to harden for at least 30 minutes. Melt dipping chocolates in 30 second intervals in the microwave and then use a double-boiler or a substitute double-boiler. Mine doesn't require any water and my chocolate doesn't burn! 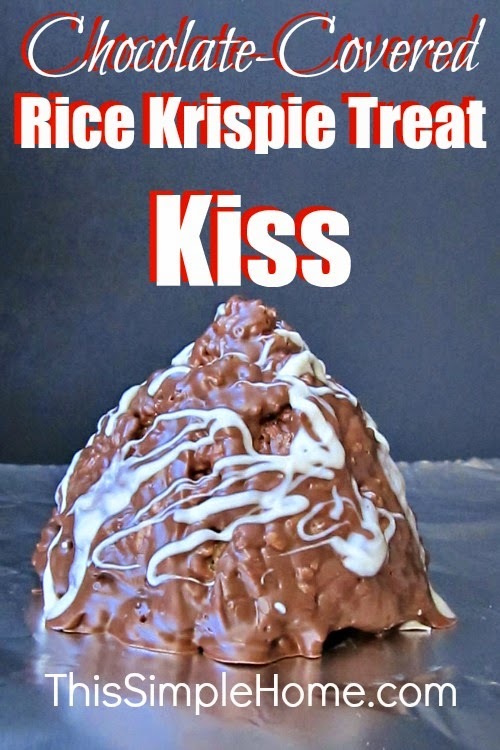 Place the giant Rice Krispies Kiss directly in the chocolate. Turn it until the side are completely covered. Then dip the bottom in chocolate. Use forks, if needed, to remove the giant kiss from the chocolate. Allow to cool. Drizzle in additional chocolate, if desired. Cut strips of wax paper about 1x8 inches. Write a special message on it using a permanent marker. Cut a square piece of tin foil. Place shiny side down. Place the giant Kiss in the center with your message strip. The message should be ink-side down. 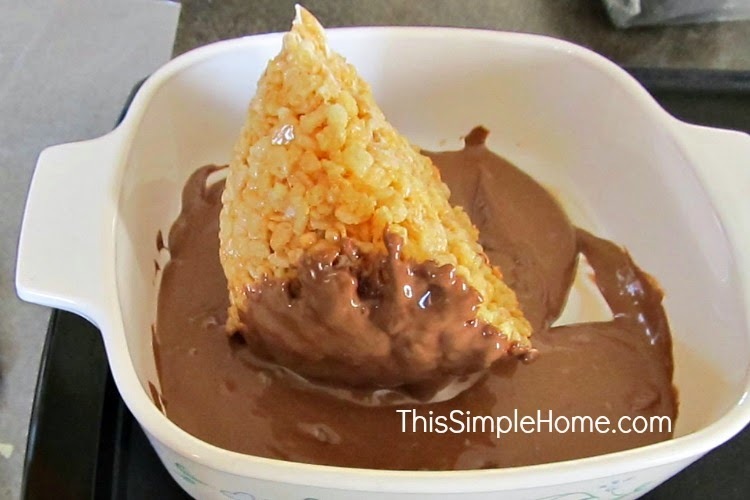 Carefully wrap your giant chocolate-covered Rice Krispies Kiss. Use any extra chocolate to make chocolate-covered grahams (just like Keebler) or chocolate-covered pretzels. All are a delight!